For Environmentalists, Mines Near Wilderness Are Too Close For Comfort A couple is spending 365 days in the nation's most visited wilderness area to raise awareness of a sulfide-ore mining plan they say will put the watershed ecosystem in danger. Some locals disagree. 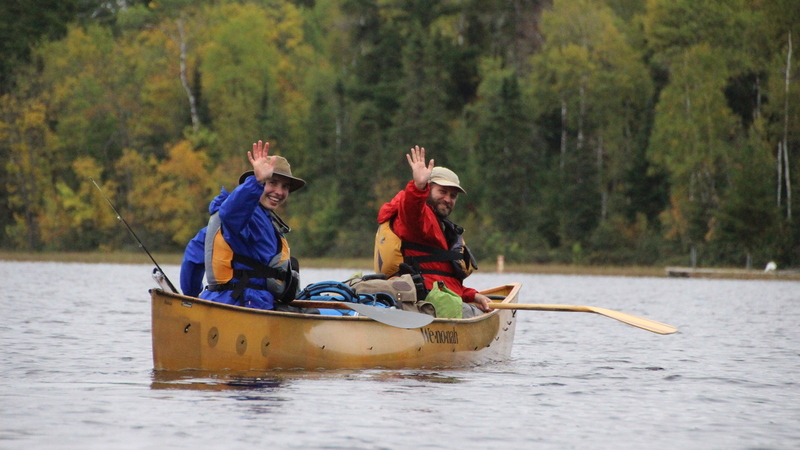 Amy and Dave Freeman paddle into the Boundary Waters, starting their 365 days in the wilderness to raise awareness of mining plans in the region. Amy and Dave Freeman are willing to risk brutal winters, thin ice and hordes of hungry mosquitoes to raise awareness about impending mining operations on the border of public lands in northern Minnesota. A year without a shower takes a tremendous amount of dedication and passion. Why do the Freemans believe the Boundary Waters Canoe Area Wilderness is worth the sacrifice? "The Boundary Waters belong to all of us. It's a national forest, it's federal lands. It's like a Yellowstone or a Yosemite," Dave says. "There's no other place like it on Earth." 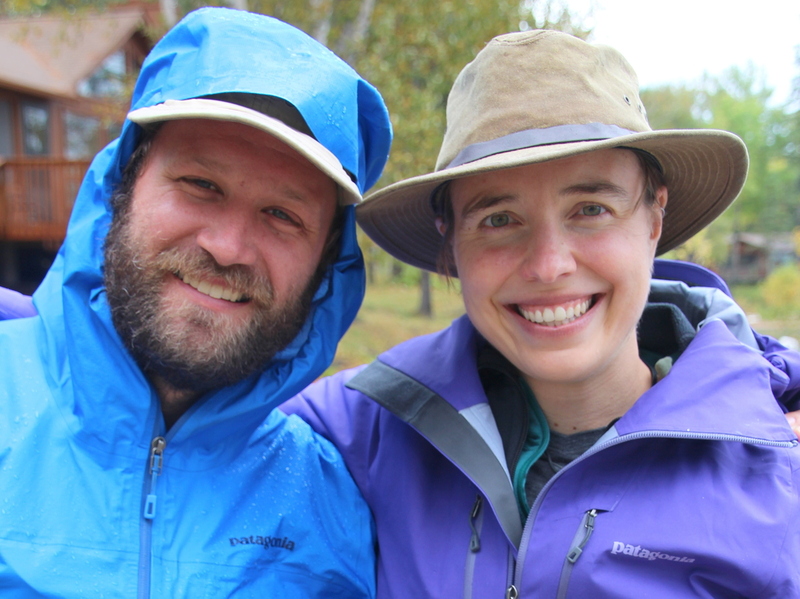 Amy, 33, and Dave, 39, are no strangers to strenuous outdoor adventures. 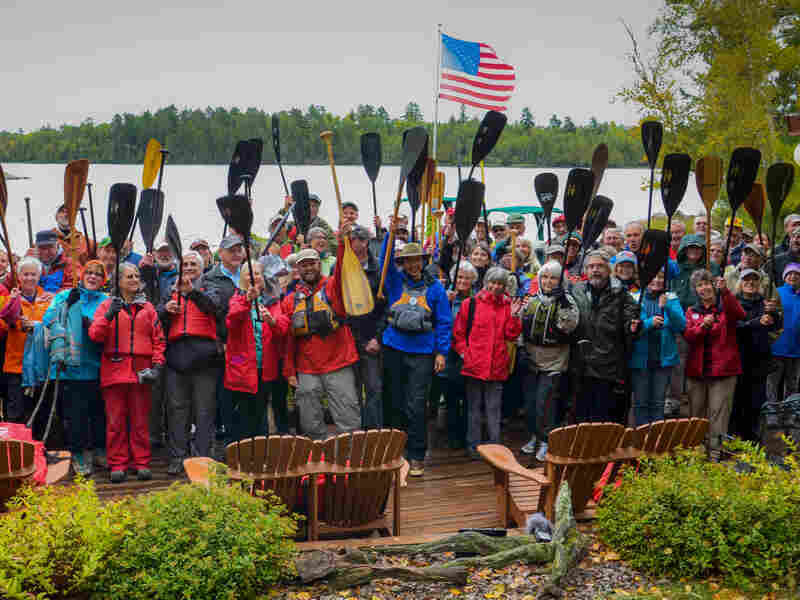 Last year, they paddled and sailed from Ely, Minn., to Washington, D.C., a grand total of 101 days and 2,000 miles on the water, to raise awareness for the Boundary Waters. Their boat acted as a petition, garnering the signatures of thousands of people who oppose sulfide mining in northeastern Minnesota. The Freemans will live in 120 campsites and travel about 3,000 miles by canoe, dog team, foot, skis and snowshoes during their year in the Boundary Waters wilderness area. They've already traveled more than 30,000 miles by kayak, canoe and dogsled through places such as the Amazon and the Arctic, earning them National Geographic Adventurers of the Year status in 2014. Now, they're back again to raise awareness about how mining might affect the Boundary Waters and are encouraging others to speak out. "We really need to step back and look at this and say wait a second, do we want to have a whole mining development running along the southern border of the wilderness zone?" Dave says. The Boundary Waters Canoe Wilderness Area attracts more than a quarter-million visitors each year, making it the nation's most visited wilderness area. It's the largest wilderness area east of the Rockies and north of the Everglades, consisting of 1,200 miles of interconnected waterways and a million acres of wilderness area within the Superior National Forest. The Freemans describe it as a maze of lakes and rivers, chock-full of timber wolves, moose, loons, eagles and more. They're disturbed that Twin Metals, a Minnesota mining company owned by Antofagasta plc of Chile, proposed a sulfide mine between two and three miles from the Boundary Waters. They say that two of the ore bodies come right up to the surface and are a threat to the region. Sulfide mines can produce acid, a dangerous contaminant for lakes and rivers when exposed to air or water. If there was a spill, potential water pollution would flow downstream through White Iron Lake and into the lakes and rivers of the Boundary Waters. "We think it will be close to the largest underground mine in the U.S," Twin Metals spokesman Bob McFarlin told Minnesota Public Radio reporter Dan Kraker in 2014. It would resemble an underground city. "You've got roads, lights, plumbing, electricity, air circulation — all those types of things that support an operation of 1,300 employees working underground in shifts, and moving a lot of material," McFarlin said. Twin Metals is not a new presence in the area. The company has drilled holes beneath the Superior National Forest for almost 10 years in hopes of finding copper and other metals. "We don't feel that the edge of our nations' most popular wilderness area is an appropriate place for such a development, partially underground or not," Dave says. Twin Metals officials said in 2014 that the mine could cost upwards of $2.5 billion to build but that the more expensive underground design would limit damage to the surface compared to an open pit mine. "We're estimating right now about 55 percent of the material that is commonly stored on the surface in mining operations across Minnesota, we'll be able to put that material underground," McFarlin said at the time. The Freemans aren't satisfied by the claim that the underground design will help minimize the environmental impact. "Any pollution from the mine sites will end up flowing directly into the Boundary Waters," Dave says. "It will also be a big industrial zone. We're talking about massive amounts of waste rock, processing facilities, things like 24-hour rock crushers." Frank Ongaro, executive director of Mining Minnesota, the copper-nickel industry trade association in Minnesota, disagrees. He would not speak specifically about the Twin Metals plan but did address mining in Minnesota as a whole. "Around any variety of sensitive water areas, there is a buffer zone. Those have been identified," he says. "In the rest of the Superior National Forest, mining and mineral development is not only acceptable, but is a desired use of the multiple use forest plan." This summer's wastewater spill into the Animas River near Durango, Colo., shows what can go wrong in the hard rock mining industry. Images of the mustard-yellow waters reinforced the impacts toxic mine sludge, accidentally released by the EPA, has on an ecosystem, community and economy. Mining is the meat and potatoes, tourism is the dessert. It looks good, it tastes good, it smells good — but you can't live on it. Dave Lislegard of Aurora, Minn. Some Minnesotans say they're well aware of the risk and only support mining projects that meet the stringent requirements and safeguards. "Everyone in Minnesota, all of us are environmentalists," Mining Minnesota's Ongaro says. "We believe that jobs and the environment have and can and will exist side by side." "We're a mining state. We've been mining in Minnesota for 130 years. We have strong regulations, second to none. We've got a system in place that requires environmental review and permitting. It's up to any company to demonstrate that they can meet the minimum requirements. And if they do, they should be advanced. And if they don't, they shouldn't move forward," he says. Ongaro says that the state of Minnesota has a global responsibility to show the world how responsible development is done. "Wind turbines, electric cars, you name it, they all take metals and we are import dependent on these metals from countries that have little or no environmental standards, don't have safety requirements, have child labor violations. We need to hold up a model to the world on how to do it right," Ongaro says. Some locals are torn. The proposal offers tempting economic benefits for the area, like more than 1,000 permanent jobs and the creation of 3,500 jobs during the construction process. They say that mining, if done responsibly, is essential for the area and reiterate that they too care about clean water. "Nobody on the Iron Range doesn't believe in meeting the state and federal standards," says Dave Lislegard, a third-generation miner and member of the Aurora, Minn., city council. "We believe in doing the right thing in the right way, that is what allows us the opportunity to provide for our families. Nobody advocates not meeting the standards. It's hard to watch people who are so adamant about pushing against our way of life. We are very proud of what we are," he says. Lislegard says he, and other "Iron Range" residents — an area in northeastern Minnesota with small communities built around the industry resulting from long swaths of iron ore — do not advocate a "rubber stamp" approach. Amy and Dave Freeman's friends, family and supporters gather at River Point Resort and Outfitting Company in Ely, Minn., across from the proposed Twin Metals mine site, in preparation for the couple's launch on Sept. 23. "I, and all of us Ely folk, love the outdoors. And love Ely. We want nothing more than to preserve our home, but we also support responsible mining," 29-year-old Natalie Tiffner said in a post on Instagram. Originally from Ely, Tiffner wishes she could raise her twin daughters there. But the lack of job opportunities for both her and her husband in Ely force her to work in Minneapolis. "Mining is a way of life on the Iron Range," Lislegard says. "It's really hard for many of us who are trying to provide for our families to understand how individuals can stop working for a year and go camp." Bottom line? Mining is essential for many in the region where the Freemans are trying to stop it. "Mining is the meat and potatoes," Lislegard says. "Tourism is the dessert. It looks good, it tastes good, it smells good — but you can't live on it." On Sep. 23, Amy and Dave launched from the River Point Resort and Outfitting Company, within eyesight of the proposed mine location. Accompanied by around 40 friends, family and supporters, the flotilla made their way up the Kawishiwi River into the wilderness area. Then the Freemans were on their own. "We're relieved," Dave says. "We've been working so hard to get everything ready. When we crossed under that bridge we were mostly excited to be finally entering the wilderness." "I had to consciously tell myself that this is really a year. It could've been just a weekend trip, because we're already so used to just that. Off you go! All of that," Amy says. This year will not be without its challenges. "A year is a long time, mentally and physically," Dave says. "If we're being honest, it will probably wear on us. Winter is going to be really hard. It takes a lot of energy to stay warm and healthy when it's well below zero." The couple, who also spend time as canoe guides, say they're looking forward to helping people understand why they care so much. "We've guided people from all over the country and all over the world," Dave says. "This summer, I led trips with people from 15 different states. People come back every year, every other year. It really is a place that people travel long distances to come to. It's hard to explain until you've been there, but it's so unique and special." "It just draws you back over and over again," Amy says. Twin Metals officials said that while they wish the Freemans a safe journey, they have no further comment on their activities. You can track the Freemans' progress on social media (#WildernessYear) and through the organization Save The Boundary Waters. Kylie Mohr is a digital news intern at NPR.org. The photo credits on a previous version of this story were reversed. Ellie Bayrd took the individual photos of Dave and Amy Freeman; Alex Chocholousek took the group shot. Additionally, we previously did not include the information that Twin Metals Minnesota is owned by Antofagasta PLC, a Chilean company based in Santiago.